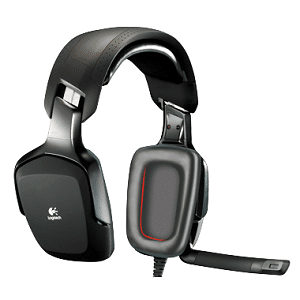 Founded in Switzerland in 1981, Logitech is a name synonymous with quality peripheral products for PC. Popular within the gaming community, they command a good professional following as well. Their products are distributed in over 100 countries through strategic partnerships with manufacturers and retail stores. They were a pioneer in mice manufacturing, which remains their most popular line of products today. However, they have also extended their repertoire to include corded and wireless accessories such as keyboards, webcams, audio devices and headphones. Designed for gaming, for a professional setting or even for everyday use, the best Logitech headphones come in many different designs. One great thing about them is that most models come with microphones, so you get two for the price of one. It’s also convenient as you can make and answer Skype calls, and communicate with teammates over gaming sessions, without having to purchase two separate devices. Some brands emphasize function over form, and have huge, bulky designs that are never meant to be taken out of a studio or home. Logitech headphones are a nice balance of both. 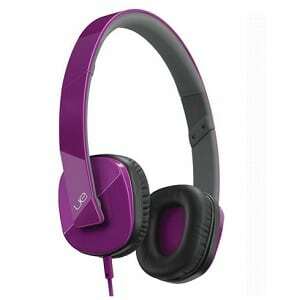 Sporting a modern, sophisticated look with sleek and shiny finishes, their headphones are usually thin and non-bulky. Their versatile, compact design means that you can use them as an at-home headset or bring them around on your travels. Certain models even feature a collapsible mechanism which allows the headphones to fold down flat for easy storage. The ear cups also play an important role in noise isolation and sound clarity. Models like the 982-000071 UE 4000 have large cups that completely cover the ears,so they can easily block out external noise while keeping audio from leaking out. On the other hand, models like the Logitech Clearchat Stereo Headset and H800 Wireless Headset have flatter ear cups which go gently over the surface of the ears for an open and natural listening experience which allows you to be aware of your surroundings. While headphones are very versatile and can be used in a variety of situations, some are designed to work well with particular applications. For example, gaming headphones tend to have surround-sound systems to provide users with a more immersive listening experience. On the other hand, models such as the Logitech 982-000071 UE4000, which feature a rich, undiluted stereo sound, helps users to identify subtle nuances in a track, so they are great for listening to music. 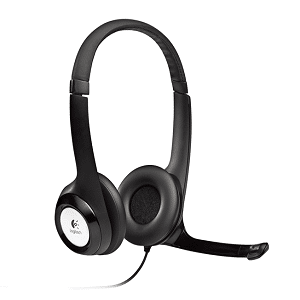 For business or professional applications, there are headphones with clear audio and a mic, for conference calls and Skype meetings. Identifying the best pair for your needs will ensure that you get the most out of your buy. Logitech carries headphones that fall within the affordable range, right up to the higher end ones, depending on their features. That doesn’t mean that the more expensive it is, the better the functions! Obviously, a wireless, Bluetooth equipped set will be more expensive than one with a cable, and the same goes for those that come with noise isolation capabilities. It all comes down to what you need and want from your headphones. Most Logitech headphones have tough and sturdy plastic body and headband, while the ear cups use either foam pads or pleather. The latter is soft and suitable for long hours of wear, but will quickly turn uncomfortable in hot weather. Most of Logitech’s headphones come with either an ergonomic design to suit different head sizes and face shapes, or an adjustable headband for a customized fit. While they are generally durable, users should also be aware of hinges, pivoting microphones and adjustable mechanisms that may become loose over time. If you’re the kind that dislikes cables, opt for a wireless headphone with Bluetooth technology. Some models even let users move as far as 40ft away from their computers, allowing you more flexibility and convenience. You also don’t have to worry about tripping over tangled cables or having to wind them up every time to put them away. Other features to look out for include in-line controls, such as volume dial or buttons, which can be located on the cable or the headphones themselves. With the Logitech H800, you can say goodbye to tangled cables. These sleek, black headphones come equipped with Bluetooth capabilities for wireless playback and communication. Users can pair them up with anything from PCs to smartphones and tablets. This can be done by plugging into a small USB nano-receiver, or by pairing the headphones with Bluetooth wireless support. Laser-tuned speaker drivers and a built-in equalizer work to create a rich, digital stereo sound that is great for listening to music or videos on your computer or MP3s.A noise-cancelling mic ensures that environmental noise is reduced to a minimum for crystal clear conversations. Rotate the boom mic closer to your face to pick up your voice better, or flip it out of the way when listening to music. The wireless range is around 40ft, or an impressive 12m, allowing users to listen and chat while multitasking. You won’t even have to run back to your devices, as there are touch controls built on the ear. Toggle through songs, adjust the volume, answer calls or mute your microphone with a simple press of a button. A beep notifies you when you’ve reached minimum or maximum volume. Each set runs on rechargeable batteries that can last for up to six hours, although battery life varies with settings, use and environmental conditions. The best Logitech headphones are charged with a detachable USB cable. At just 11 ounces, the headphones are lightweight but the body is nevertheless sturdy enough to withstand wear and tear. The headband is padded and adjustable to fit different head sizes and face shapes, while the sculpted ear cups go over the ears for a feel-good fit. They are covered in a soft, memory-foam material and are comfortable for long hours of wear. The headphones fold down like a pair of sunglasses so they’re perfect as a travel companion. The Ultimate Ears or UE4000 headphones certainlylive up to their ‘ultimate’ label. Designed for music lovers, their Sound Signature technology offers audio that is rich, clear and perfectly in tune. Powerful 40mm transducers bring soundtracks to life and a wide sound stage creates a 3D-like effect by accurately pinpointing a sound’s location. High sensitivity drivers with neodymium magnets produce crisp and clear trebles, a warm mid-range and deep bass. The lower frequencies can be slightly jarring, but the levels are generally balanced and they highlight subtle nuances and detailing in the music tracks fairly well. The UE4000’s stylish, eye-catching design is made for the young and young at heart. Available in funky, popping colors like black, purple and white, the headphones carry a smooth, gloss finish and chrome accents for added flair. Large cups enclose the ears with soft and plush memory-foam material, which is not only comfy for extended wear, but also help to isolate noise better. The closed back design ensures that no audio leaks out, so you won’t be bothering the passenger next to you with your music. Even though they have no noise cancelling features, they are quite effective at blocking out environmental noises. An adjustable headband ensures a custom fit. Good things are meant to be shared, so the UE4000 comes with a two-person sharing splitter which allows two jacks to be plugged in, so users can share music with their friends. For added convenience, all the music and call controls are on the cord, so users can adjust volumes, pause music, and answer or end calls without having to touch their electronic devices. However, since these headphones were developed for Apple devices such as the iPhone, iPad and iPod, their functionality may vary with non-iOS smartphones or tablets. Each set comes with a zippered pouch for easy carrying. The headphones are non-foldable, but it shouldn’t be a problem since they’re compact and lightweight. The Logitech H230 is a fun analog headset to bring around and show off in public. They come with swappable faceplates in different colors, so you can switch them out to match your style of the day. 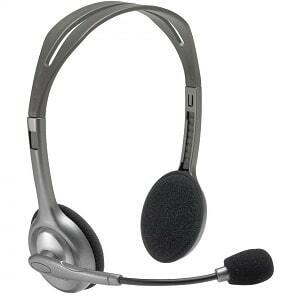 If you’re not bringing them out on your daily commute, they work fine as headphones for gaming or making calls. High sensitivity drivers provide a full and clear stereo sound. While the quality is nowhere near great, they are good enough for watching Youtube videos or listening to music. The real star of the H230 is their noise-cancelling microphone, which minimizes echo and mutes background noises. Reviewers have commented that voices sound crisp and clear on the other end, with minimal distortion. The mic is flexible and can be rotated out of the way when not in use, or pushed closer to better pick up your voice. Unlike most headphones which are bulky and go over the head, the H230 sports an unobtrusive look and is worn behind the ears. The ear cups are small and covered with foam tips for maximum comfort. As they go on the ears instead of enveloping them completely, noise isolation is not high and users will be able to hear ambient sounds. Discreet and slim, the headband consists of a thin frame that contours around the back of the head. At just 8 ounces, they are one of the most lightweight headphones on this list. Because of this slim fit, they are non-adjustable. In-line controls on the cord mean that users can adjust volume and mute soundtracks without having to press on their devices. Each set comes with an 8ft long cable and features a 3.5mm stereo output. Considering the price point, these are good value for money and should easily be able to last up to a year with proper care. Looking for a cheap but functional pair of headphones? 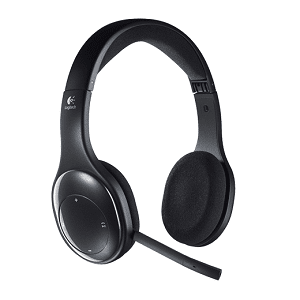 Then the Logitech Clearchat Stereo Headset is a solid choice that won’t burn a hole in your pocket. These sleek and lightweight headphones are designed to be paired with computers and laptops rather than smartphones or tablets, since they come with3.5mm analog plugs. A clear stereo sound makes them suitable for listening to music, watching videos, casual gaming and making Internet calls. They have a frequency response between 20Hz to 20,000Hz and offer well-balanced lows, mids and highs. With a name like ‘Clearchat’, it’s obvious what the manufacturers had in mind. This is achieved by their noise-cancelling microphone, which reduces environmental noises so that the person on the other end can hear crystal clear voices with minimal distortion. The mic is fairly sensitive, with a frequency response of 100 to 10,000Hz. It can be rotated 180 degrees, so swing them out of the way when you’re focusing on your music or movies, or pull them closer for chat sessions. A pivoting weighted base provides stability so you can tilt the mic with ease. Users can tweak the volume or mute the mic with convenient in-line controls found on the cord. The Clearchat is very lightweight, clocking in at just 3.21 oz. Their ergonomic, horseshoe-shaped design is comfy and the headband can be adjusted for a custom fit. Their flat ear cups feature thin, foam padding which is easy on the ears, but they wear out quickly. Each set comes with a 8ft shielded cord, allowing users more freedom of movement. The power switch acts as a helpful indicator as it lights up when the mic is turned on. Overall, the Clearcat offers adequate sound and recording quality and is able to withstand moderate use. Despite being first launched in 2007, the Comfort remains one of Logitech’s bestselling computer headphones even after eight years – a testament to their quality, price and overall functionality. Although they share the same name, there are quite a few differences between the Logitech ClearChat Comfort and Logitech ClearChat Stereo reviewed earlier. The Comfort has a different design altogether – instead of thin, lightly padded ear cups, they carry large bulky ones with soft pleather cushions that envelope the wearer’s ears. This allows for better noise isolation and prevents audio leakage. The headband is padded for extra comfort, and adjusts to fit different head shapes and sizes. Despite their price point, the Comfort is solidly built and feels sturdy, unlike other cheap headphones on the market. Design aside, the Comfort employs the same basic principles: to provide crystal clear voices whilst keeping annoying background noise to a minimum. This is achieved by a rotating, noise-cancelling microphone, which is effective at blocking out environmental sounds such as traffic – making these headphones perfect for regular Skype calls or even online business meetings and conference calls. The sound quality is alright, with an acceptable amount of bass. It is super easy to use, as no set up is required. Users simply plug and play with an advanced digital USB. 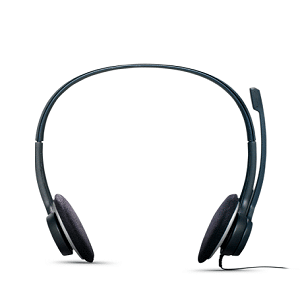 The headphones are compatible with newer software such as Mac OSX and Windows 10 as well as older versions like the Windows 2000, Windows XP, Windows Vista and Windows 7. An 8ft cable allows users to move away from their electronic devices for added flexibility, and it is easy to mute or control the volume since in-line controls can be found on the cord. At their very affordable price point, you’ll be hard pressed to find a pair of headphones with similar quality. The Logitech G933 headphones look like something out of a cyberpunk movie. Designed for gaming, these bad boys offer unparalleled sound quality and features to satisfy even the most hard-core audiophiles and gamers. Enjoy a cinematic listening experience with DTS Headphone: X Surround Sound and 8.1 Dolby Surround Sound, which create a rich, full sound that seems to come from all around you. Users have the option to switch between these two systems through a software support program. Meanwhile, advanced Pro-G audio drivers ensure that your audio is crisp and clear, whilst accurately pinpointing sound locations so gamers will be able to hear enemies sneaking up behind them, or look out for audio cues in a game. Too many matches have been lost due to faulty mics resulting in poor in-game communication. The G933 eliminates that worry with a solid, noise-cancelling mic that delivers voices in high clarity whilst muting out background noise. One great feature of the G933 is their programmable G-Keys, which are located just next to the ear cup. Using the Logitech Gaming Software, users can input up to three custom commands for a seamless gaming experience. For example, set a button for cycling through music tracks;activate push-to-talk communication or trigger instant in-game command combos. Another great feature is their sound mixing abilities. Having to stop in the middle of an exciting match to answer phone calls can be a real bummer. The G933 allows sound mixing with up to three devices, using a USB Mix Adapter or two analog inputs, and perfectly balances the audio so they won’t overwhelm one another. 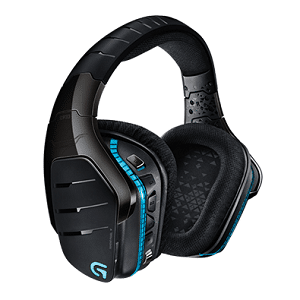 Design wise, the G933 is huge and bulky, and the cushioned ear cups are apt to swallow up smaller faces. The headband is also thick and padded but offers extra comfort for long hours of wear. They come in wired versions, but the wireless ones offer the flexibility of being able to move away from your PCs or gaming consoles, and has up to 12 hours of battery life (at 50% volume). The headset comes with adjustable RGB lighting with up to 16.8mil colors. They work with PC, mobile, home theatre devices and game consoles such as PS4 and Xbox One. 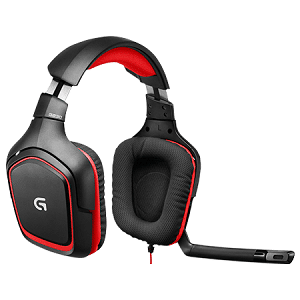 The G230 has the gaming look down pat – huge and bulky ear cups,an aggressive red and black color scheme, angular lines. But when it comes to functionality, they work very much like traditional headphones. For one, they offer high quality stereo instead of surround sound, which hampers their ability to locate in-game sound directions with pinpoint accuracy. They also lack software for customization, unlike higher end gaming headphones. That doesn’t mean the sound quality or performance is bad. For casual gamers looking for a solid, entry-level pair of headphones at a budget price, these headphones do the job just fine. While probably not ideal for shooting games, they work well enough for RPGs, adventure and puzzle games. The sound quality is decent and well-balanced, although a little weak on the bass. If you’re used to listening to bass-heavy headphones, these will take some time getting used to due to their flat response. For added convenience, the in-line controls such as volume dial and mute are located on the cord. 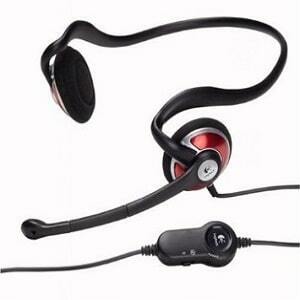 Beyond gaming, they are good for making Internet calls, such as on Skype, Messenger or Google Hangouts. The noise-cancelling mic works as advertised and is fairly decent at reducing background noise. It can be rotated out of the way when not in use, although its semi-flexible feature makes it stiff and difficult to adjust at times. 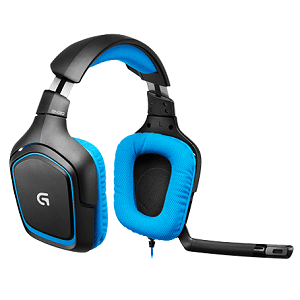 The G230 has the advantage of being one of the few gaming headphones that have swivelling ear cups. The headband is expandable for a customized fit. While the plastic and rubber construction is lightweight and sturdy enough, you probably don’t want to stuff these headphones into a bag with loads of heavy luggage on top. All in all, the G230 is a versatile pair of headphones for casual gaming and regular use, although you probably wouldn’t consider them if you’re a serious, tournament-level gamer. When you’re gaming on a competitive level, every sound and tiny cue can make the difference between winning and losing a match. ‘Hear them before you see them’ is the mantra adopted by the Logitech G430. Thanks to their Dolby 7.1 surround sound system, the headphones offer superior sound quality and an immersive 360-degree sound field that accurately pinpoints in-game sound locations. Pair that with powerful 40mm neodymium drivers and Low Frequency Effects technology and you get clear, realistic sound details that make you feel as if you’re inside the game itself, listening to enemy footfalls or dodging gunfire. In-game communication is just as important as sound quality, and the G430 delivers with a foldable boom mic. While it’s highly sensitive and can pick up voices well, the noise-cancelling feature ensures that background noise is reduced to a minimum. It can be rotated out of the way when listening to music or watching videos. Built for comfort, the headphones sport a balanced assembly, study construction and large ear cups. The latter is covered with soft performance grade cloth that is easy on the ears for long hours of wear, and can be removed for cleaning. Unlike pleather, the material is breathable and prevents moisture and heat build-up. For a more personalized fit, the cups feature a 90-degree swivel, while the headband is adjustable. Controls such as the volume dial and mute button are located on the cable so users can adjust their settings quickly without missing a beat from their game. The G430 also comes with a 2.3m cable for flexibility. They work with gaming consoles such as the PS4 and are compatible with older systems such as the Windows 7, Windows 8 and Windows Vista. Similar to the G430, the G35 aims to offer rich and detailed surround sound for an unforgettable gaming experience. Equipped with Dolby technology, the headphones process audio as 7.1-channel sound. Two 40mm drivers help to create a wide soundstage for better texture, depth and 360 degree sound imaging. Unfortunately, the G35 falls short of the mark. Although the headphones use processing tricks by blending sounds from the left, right and centre so that audio seems to come from different directions, their two individual drivers are simply not enough to recreate a true surround sound effect. That being said, the headphones offer exceptional sound quality – just not the surround sound that they’re marketing. They are great for casual gaming and for listening to music, with clear highs and detailed mids, although the bass is lacking somewhat. They can also be used for watching videos and movies, or making Skype calls. The noise-cancelling mic picks up voices and reproduces them on the receiving end with crystal clear clarity, whilst blocking out environmental noises. A thoughtful addition is a glowing red indicator light, which tells users when the mic is muted. It can be rotated out of the way when not in use. Three customizable G-keys located on the back of the ear cup allow users to control volume, media playback and other features through the Logitech G35 software. On the other cup, there is a slider switch which toggles Dolby Digital processing on and off. The set comes with three swappable pads for a customized fit, including thin, thick and contoured. The H110 is one of the cheapest headsets on this list, but offers reliable quality especially for regular applications such as making Internet calls or listening to music. Users can expect high quality stereo sound played through two channels. The headphones have a frequency response of 20Hz to 20,000 Hz, while the mic has a range between 100Hz to 16,000Hz. While the mids and trebles are clear enough, they lack a little in bass. The boom mic is sensitive and picks up voices fairly well. It also comes with noise-cancelling features that are designed to minimize environmental noise. However, it tends to pick up noises when things touch the headset, such as when cords accidentally brush against the frame. The upside is that it’s very flexible, and you can wear it either on your left or right side, depending on which position picks up your voice best. When not in use, simply rotate it away from your face. Compared to some of the monster-sized headsets on this list, the H110 is small and features a discreet, over-the-head design with thin ear pads. The headband has a sliding mechanism which allows users to adjust them to fit different head sizes. At just 1.8 ounces, they are so lightweight that you’ll barely feel them on your head, making them comfortable for long hours of wear. One thing to note is that while they work with Windows software, the headphones are not compatible with Apple devices. They also do not carry in-line controls. Each set comes with two 3.5mm mic and headphone jacks, which work with any PC sound card, as well as a 7ft long cable. Sporting a simple, grey color and shiny finish, the H110 looks utilitarian – but that’s just what they are: a functional, no-nonsense pair of headphones that does the job for a very affordable price point.